Warranty Master™ takes the guesswork out of managing warranties, generating sales opportunities for you and reducing risk for your customers and using Squidworks LabTech plugin for Warranty Master keeps that data in front of you and quickly accessible directly from your LabTech consoles. 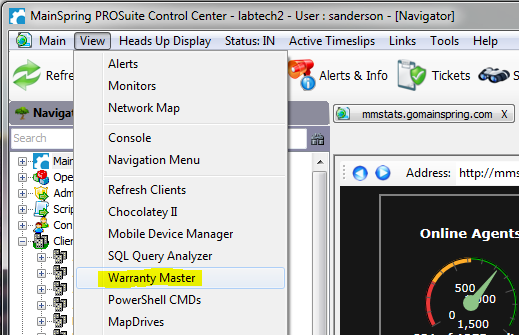 Simple to find and navigate to, just select the Warranty Master menu from the View Menu bar. Love your website! Am I dumb or is there a way to automagically sync serial numbers from LT to CW? The Labtech people said no but in 2015 I can’t believe that to be true. Hey, is anyone else having issues logging into Warranty Master from within the integration. I go to View -> Warranty Master. Login, credentials accepted. Yellow Banner at the top with warning IP has changed.